One of my favourite segments of Kyle Dine & Friends allergy awareness video is on hand-washing. It’s such an important message for kids to remember to wash their hands before and after they eat. It helps keep everyone safe and healthy whether they have food allergies or not. It’s a key way to reduce cross-contact too. This rap is a fun way for kids to remember the steps and do the actions along with the video. Enjoy! I am so happy to announce that my “Kyle Dine & Friends” allergy awareness DVD is now on Amazon.com! Getting a DVD on Amazon.com is no easy feat and I wish there was an easy guide to do so…they do a good job at ensuring no pirated films are sold on their site. Please take a minute and write a review on the Amazon page. Even just a 5-star rating helps boost the customer credibility. I really appreciate your help! Reblogged from Lauren’s Hope. Enter to win a $50 gift certificate and DVD on their blog. I have worn a medical ID all of my life and am pretty savvy by now at snapping bracelets on and off. Nothing ever prepared me for the fun that would come with trying to get bracelets on a crew of various sized puppets! That’s exactly the scenario I faced while filming an allergy awareness video for kids! My cast for Kyle Dine & Friends – Allergy Awareness with Music, Puppets and Games involved 9 puppets and myself. Flimsy foam arms were all over the set with bracelets falling off as puppeteers jolted them in motion. We quickly found the solution for keeping bracelets on their little flimsy wrists – tape! The end result was perfect: a series of characters flaunting their beautiful medical IDs graciously donated to the project by Lauren’s Hope. One of the main puppet characters is named Suzie, and she sported a really cool beaded bracelet [shown above]. I rocked the paracord bracelet and loved that the smooth fabric didn’t scratch my guitar while playing! One of the songs in the educational video is called “Cool Bracelet” and is aimed at normalizing food allergies, and the precautions needed such as wearing medical ID. In the video, I explain some of the features of why these bracelets are so cool and that you should look for them if you ever see someone feeling sick or in distress. What other piece of jewelry can help you out in an emergency? Plus look really funky! Unlike my puppets, I don’t use tape to keep mine one, but I wear mine so much you might be fooled! As someone who has experienced anaphylaxis before, I don’t take the chance with my condition and feel more secure when I’m wearing my medical ID. I thank Lauren’s Hope for joining me to help spread food allergy awareness! TORONTO (September, 2015) – With food allergies affecting the lunch boxes of roughly two students in every elementary school classroom, it’s hard to believe that there has never been a video to teach students what food allergies are all about. Anaphylaxis is not a particularly “child-friendly” term, but when conveyed with music, puppets and games, allergy educator and entertainer Kyle Dine has found the winning formula with his Kyle Dine & Friends DVD. After performing allergy awareness assemblies at over 600 schools for nearly a decade, Dine wanted to reach even more classrooms by putting his messages on video. The need for such a resource became very apparent through an instantly successful Kickstarter campaign that raised $30,000 – 150% of his original goal. The 2-disc DVD set includes two separate shows aimed at children aged 4-7 & 8-11 respectively. “The videos are consistent with my assemblies which are split between kindergarten to grade 2, and grades 3 to 6 with age-appropriate messaging,” notes Dine. The content covers common allergens, symptoms of allergic reactions, emergency procedures, and reinforces key school policies such as no sharing food and hand washing. Conveying such big topics isn’t easy, but Dine gives credit to his cast of zany sidekicks; “The songs are effective at reinforcing key messages, but the real superstars are the puppets who make learning fun and engaging for kids!”, Dine chuckles. Kyle will be serving a community and educational market that’s eager for resources that help raise awareness and spark conversation. “Teaching children about food allergies in this fun and interactive way may help them develop a sense of empathy and understanding for others,” added Gina Clowes, Director of Education, Food Allergy Research & Education, FARE. With support from renowned allergists, healthcare professionals, principals, teachers, families, support groups and global organizations, such as Food Allergy Canada and Food Allergy Research & Education (FARE), Kyle Dine & Friends will fill a widespread educational gap. Kyle features a mix of his new and classic kid-tested songs and his most beloved characters, such as Suzie Symptoms™, Chef Allergie™, Miss DeLabel™, and Pierre the Peanut™. The end result is a resource with important educational messages that kids will soak up on keeping their friends with allergies safe, while having a ton of fun in the process! The Kyle Dine & Friends video can be purchased for $25.00 at www.foodallergyvideo.com. 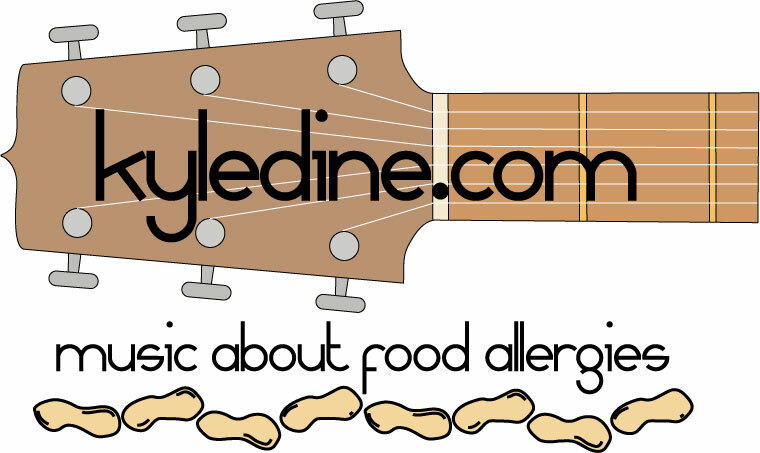 Kyle Dine is a trusted food allergy educator and musician who performs engaging allergy awareness assemblies in elementary schools across North America. He educates students about allergies, anaphylaxis and what they can do to help keep others with allergies safe. His two CD releases titled “You Must Be Nuts!” and “Food Allergies Rock!” contain empowering and educational messages for children with food allergies. He has multiple food allergies himself and has worked with Food Allergy Canada since 2008. His next school tour will take place from January to March 2016. For more information, please visit www.kyledine.com and find him on Facebook, Twitter, YouTube and Instagram. Make the day of your child’s teacher, your local librarian, a newly diagnosed friend with allergies, or just keep a backup copy for yourself! For the next week it’s a “get one, give one” deal! The song and motto “Food Allergies Rock” is one that I get questioned on frequently, leaving people often scratching their heads. Fair enough! It’s an odd statement! However, I urge you to read this full blog post to see why I’m not crazy for saying “Food Allergies Rock”. To completely contradict myself, let me start by saying that food allergies do not rock in the literal sense. We know what anaphylaxis is, what it can do, and how scary everything associated with it can be. No one signed up for food allergies, and given the opportunity, no one would. Who would want a relationship status with food that can be best described as “It’s Complicated”?? In my 30+ years of living with multiple food allergies (peanut, tree nut, egg, seafood and mustard), I’ve had a lot of low points and scary close calls. Some days I curse my allergies. Truth be told, I curse my asthma much more. At the end of the day, I am an individual living with a severe but manageable health condition. I believe how I view my own allergies affects my own quality of life, and the perception other people have of me. Do I want to feel and be viewed as a victim? No. Do I want to feel and be viewed as someone living in constant fear? No. Do I want to feel that life is always unfair and be viewed as someone who lives under a dark cloud? No. Do I want to feel like a confident and normal person who is never slowed down by their food allergies? Absolutely. I wrote “Food Allergies Rock” to flip my own perspective on my condition. If I can “rock” my food allergies, I will be more confident and empowered to stay safe. I choose not to let food allergies define me. I stay positive while staying safe. I read labels, carry epinephrine, ask the right questions at restaurants and more. I got this. I know “Food Allergies Rock” a line that might be hard to grasp. But as someone who has the condition, this perception/self-talk/attitude has actually made me less of a risk-taker, and improved my overall quality of life. To me, that rocks! With all of the other severe and unmanageable health conditions out there, I feel somewhat fortunate to have only food allergies. I’ve learned how to live with them, travel with them, the precautions needed, the ways to deal with frustrations, and how to rise above them to live live life to the fullest. If reading this makes you think, “wow, he really rocks his food allergies”, then you now know the power that a little catchphrase can have on the psyche. I hope you and your kids can rock your food allergies too!